Anyone know of an EASY pattern for a quilted bag?? Thread: Anyone know of an EASY pattern for a quilted bag?? The construction should be easy, I can do stars and stuff. And while I am asking, what would you use on the back of a quilted rug? I saw a gorgeous one the other day, but I didn't like the back, seemed like it would slip? Burlap, maybe? I got an email from moda bake shop yesterday and they had a really cute bag. I've seen others on the Internet. Just google quilted bags. Would also like to know what to put on the back of the rug. I will go over to Moda, see if I find anything that looks easy! On the bag of quilted rugs. I made a quilt which gets on the floor I hand stitched some nonslip stuff to stop sliding and accidents happening. Does it matter what is on the back if it goes on the floor? OR. do you call a throw on a sofa a rug as my SIL does., you can then use a my fabric one big piece or just scattered blocks . Some the back looks more exciting than the front especially when a long arm quiter has finished. I was thinking about the nonslip stuff, like the stuff you put in cabinets? Yes, sometimes I like the back better!! There is some non-stick stuff that you put under rugs. But I've had trouble getting it to stay in place. You could sew it on and then it would stay. I was thinking of something else, though. An aunt (now deceased) gave us some t-shirt decorations made of needle-punch (like a rug, made with yarn). She sprayed or spread a product on the back that allows it to stick on the t-shirts, then taken off and stick on something else. It won't stick any more if it gets dirty. I think it was a product made by Alene. I looked for it in stores and I was never able to find it. Maybe someone else knows what it is. Check out Lazy Girl patterns. She has good instructions. Jenny Doan has a tutorial on YouTube for an easy peasy quilted bag. My friend, Fran, here on the board, can whip three of them out in a day. One or more of the big box stores i.e. Lowe's or Home Depot, has a rug/carpet section and we found a waffle type non-slip backing to put under throw rugs, long runners, and such. Works well on our wood floors. I just made a quilted rug. I used Super Grip. Just spray it on. My DSIL came over and did the scuff w/the foot to see if she could move it. Not an inch. JoAnn's is supposed to have a similar product. Haven't tried it. But w/a 50% off coupon, it would be worth it to try it. that I have bought, that I just loved and couldn't do without. You understand. This is to be my next project. I have used silicone caulking on the backs of a few rugs. I didn't make them; just bought a few for in front of the kitchen sink etc that were not backed and slippery. so, I got out the tube of silicone caulk I had for around the tub and squeezed thickish strips about 2 inches apart along the length of the rug. let it dry over night and works great. 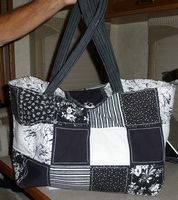 Here is what I do for quilted bags. Regardless of the pattern for the purse, make your quilted fabric first. I take the patchwork I want to use, or just one fabric piece, as you wish and quilt it down to some cotton batting, such as hobbs or warm and natural. I can quilt it with the batting next to the feed dogs and have no problems. Then I use a separate piece for the lining. Sometimes I use up batting scraps by connecing them up to the right size. Quilting a small piece, half yard, is easy and good practice for getting your stipple or meandering done well. I have a simple pattern for a tote. It uses two half yards. Quilt up one half yard. Cut 3" off the top of each piece, that is the short side. Four strips 3" by approx 18". These will be your handles. stitch up the handles making a tube of quilted fabric, open at both ends, center handles on right side of quilted fabric....18"side. I usually just consign the lining piece to the scrap bin. Pin the handles in place, place lining over this so right sides are together with handles inside. Stitch through all layers across this sandwich, at the tops. Open it out and you will have a sort of tube. Place rst of lining, and then of quilted layers, leaving an opening for turning on lining side. Make sure that both top seams are lined up exactly. Turn to right side. stitch up lining opening with one eighth seam. tuck lining inside and top stitch around the bag top to help keep the lining inside the bag. Alternately you can box the bottoms. I think there's a product, intended for hooked or latched rungs to keep the yarn from pulling out, that is a sort of liquid latex that you paint on with a brush. Ask at Michael's or Joann's or other craft store. 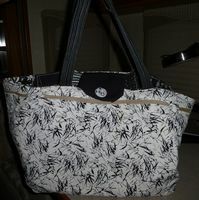 As Jcrow said, I can easily make 3 of Jenny Doan's bags in a day. I have made 21 of the bags so far and love making them. I give them to my daughters, granddaughter, and to foster children. I am getting ready to make some more of the bags. The things I do differently are that I add pockets to the lining, add a 2" Velcro closure, and use stiff iron on interfacing in the handles. Also, I use Soft and Stable for the batting. Everyone who gets one of the bags loves it. Jenny's pattern is so very easy; but it makes a beautiful bag. I wonder if you drizzle hot glue onto the back of the rug it would keep it from slipping? large buttons, one for outside of bag and one for reverse side. Last edited by d.rickman; 08-19-2013 at 08:34 PM. here is the layout for the 5 inch square big bag - sew all 5 inch sq. together in this layout in the shape of an "I", then place the batting on the backside and , cut out your lining (for each side leaving about 1" longer - leave this open for turning your bag to the right side, lay the straps on each side of the bag- so they will be on the inside with only the strap to go over your shoulder on the outside, stitch all four ........."outside 5" squares, batting, straps and lining around the outside egde", leaving the bottom of the lining open for turning right side out. the bottom of the lining open to. This is great! Very easy to understand! Thank you! Thank you all so much for your bag suggestions and rug ideas. You are all very knowledgeable and generous!